THE LEGACIES of the 44 brave men who died on Jan. 25 in Mamasapano, Maguindanao province, go beyond the camouflage they wore, the black berets they earned and the medals they merited as members of the Philippine National Police Special Action Force. INQUIRER.net remembers each of the #SAF44 through short profiles on their lives not only as policemen but as family men, as friends, as colleagues, as countrymen. The profiles below are a work in progress. The last time Ryan Ballesteros Pabalinas left his house, his wife Erica and their daughter didn’t want him to go. Ryan, who graduated from the Philippine National Police Academy (PNPA) in 2006, loved being a policeman. He even dressed his toddler daughter in tiny versions of his PNP uniforms. To the rest of the country, Ryan is a policeman and a hero. But to the people who loved him, he was Rye, a cherished husband, father, son, brother, cousin, uncle, friend. “Kuya Rye! Thank you for defending the country and its citizens. We will miss you!” one of his cousins wrote on Facebook. That book is now on an altar in their family home in General Santos City. In the center is a crucifix and a rosary, and spread around them are pictures of Ryan, other books, messages and pieces of his life of service. Senior Insp. John Garry Alcantara Erana’s sister really wanted him to be at her wedding. So earlier this month, when he told her his training in the United States would coincide with her special day, she decided to move it. Garry’s sister’s wedding wasn’t the only one the Erana family was looking forward to. Garry was set to marry lawyer Suzette Tucay next year. They met over three years ago at the wake of her brother, who was killed while battling Moro bandits in Basilan province. They were engaged in 2013. Garry, who graduated from the Philippine National Police Academy as Baron of Class 2009, believed in the importance of education. He was a man of ambition and his dreams weren’t just his own. Wanting to secure a good future for him, his bride-to-be and their future family, he helped finance Suzette’s studies in New Zealand, where she is taking a business course. He was pursuing his doctorate at the time of his death. Max Jim Ramirez Tria, nicknamed Mac-mac by his family, was the only one among five sons to follow in his father’s footsteps as a policeman. The 27-year-old police officer from Virac, Catanduanes, was proud to be a member of the Philippine National Police Special Action Force (SAF), Tria’s father Guillermo – 53 and also a senior inspector – had told the Inquirer. Even before joining the SAF, Tria had attained top honors in sniper school, commando and scout ranger training, and in handling explosives and ordinance. Tria entered the Philippine National Police Academy right after graduation from the CSU Laboratory Schools and came out one of the youngest graduates. He had four brothers, the eldest of whom had asked him to be the best man in his wedding to a policewoman this May 18. Mac-mac’s youngest brother Guio posted on his Facebook page a photo of them together on the slain soldier’s graduation day in Zamboanga. Guio said on Facebook that his Kuya Mac was “one of the bravest men I had in my life” and fiercely protective of their family. “Kuya Mac, I won’t forget what you said to me once over drinks at home. You told me, “Bam, should anyone hurt this family, a house will explode.” But now, our hearts seem to be the ones exploding because you are no longer with us, because we can no longer be with you. We will never forget you,” Guio wrote. Tria was close to Senior Inspectors Ryan Pabalinas, John Garry Erana and Joey Gamutan, also among the 44 slain. Senior Insp. Cyrus Anniban of Balbalan, Kalinga province, was part of the Philippine National Police Academy’s (PNPA) Class of 2010. Described by many as humble, Cyrus was a born leader — he was a boy scout troop leader, he was a high school CAT officer, he was company commander of his PNPA class. His family members, friends, former teachers and classmates have expressed their sorrow over his death. Some of them wear shirts printed with his face, his batchmates at Saint William’s Academy welcomed him back to their hometown with a banner. His loved ones have set up “Cyrus Anniban – Our Hero,” a Facebook page dedicated to him, where people have been sharing photos and tributes. Cyrus was a veteran of the Zamboanga City siege. Senior Insp. Gednat Tabdi, 27, hails from Mountain Province and was part of the Philippine National Police Academy’s Kapit-Bisig Class of 2009. At 17, he made the leap from studying veterinary medicine to enrolling at the police academy. He was 21 when he graduated. He was dedicated to his job. He survived in 2013 the Zamboanga City siege, where he witnessed the deaths of his friends and comrades. While there, his goal became clear. He wanted to get married and build a family. He was well on his way: at the time of his death, Gednat was excited for the birth of his first child. His wife Leah was pregnant with a baby boy. They were married just last year. He also leaves behind his parents and five brothers, three of whom are policemen – one is also a member of the Philippine National Police Special Action Force. Inspired by Gednat’s heroism, his youngest brother who still in college says he wants to join the PNP and become a member of the SAF. Senior Insp. Joey Gamutan, 33, and his wife Merlyn celebrated their seventh wedding anniversary miles apart. It was Jan. 24, the day before the bloody operation that took his life. The next day, despite being deep in the battle, Joey was able to call Merlyn one last time. A day later, their firstborn turned 5. Joey and Merlyn have one other child. The kids, whom Joey constantly checked on even while he was away on deployment, will now grow up without their father. “My husband really loved being in the service,” his wife told the Inquirer. Joey, who is from Basilan province and who finished high school at Zamboanga National High School West, joined the PNP in 2009. Senior Insp. Rennie Tayrus, who hails from Zamboanga del Sur province, relished being a policeman, even if it meant being deployed on his birthday. His father did not live long enough to see him graduate from the Philippine National Police Academy in 2011 — he passed away the year before. But Rennie’s other family members were there to celebrate with him. He chronicled his life with photographs — his journey from cadet to senior inspector, his neatly folded uniforms and his polished boots, the awards he won at the PNP-SAF Challenge 2013. Rennie loved inspirational quotes, sharing them regularly with his friends. When he was a cadet, Rennie kept a figurine of a knight in his locker — a symbol of valor, courage and honor, values that he lived by. SPO1 Lover Inocencio of Davao del Norte province was a family man. He spent the holidays with his wife Liezl and their only child, who turned 5 two days before Christmas. The 38-year-old served the country for 13 years, joining the Philippine National Police in 2002. He received a medal for his participation in the Zamboanga City siege. 9. Police Officer 3 Rodrigo F. Acob Jr.
Until his death, Rodrigo Acob Jr. was a police officer through and through. Rodrigo, who grew up in Aurora, Isabela province, graduated from Philippine College of Criminology in 2000 and joined the SAF a year later. He may be tough on the field but at home, out of his uniform, he was a loving father who showered his children with affection. There are so many photos of Rodrigo with his arm around his son and carrying his young daughter. Rordigo spent the holiday season making memories with the people he loved: going to the mall with his wife and kids, celebrating Christmas with his extended family, watching his daughter compete in a kiddie pageant, singing karaoke at a New Year’s celebration. They are still reeling from the news of his death. PO3 Virgel Villanueva, 39, is from San Pablo, Zamboanga del Sur province. 11. Police Officer 3 Andres Viernes Duque Jr.
PO3 Andres Duque Jr., 37, is from Aurora, Isabela province. He joined the Philippine National Police in 2007. Andres’ remains arrived in his hometown of Barangay Divisoria around 6:30 a.m. on Jan. 31. He was welcomed home by local officials and policemen. PO3 Victoriano Acain, 32, joined the PNP in 2006. Originally from Gutalac, Zamboanga del Norte province, he graduated from Gutalac National High School and Andres Bonifacio College. He leaves behind a wife and a 7-year-old child. PO3 Noel Golocan, 34, will be remembered by relatives for his “smiling face”; his wife Angeli has up a profile photo with him on her Facebook page. Noel graduated high school in 1998 from Lepanto National High School in Mankayan, Benguet province. He continued his studies at University of the Cordilleras in Baguio City before joining the Special Action Force. His cousin Megan Abad shared on Facebook a video in tribute to Noel. The video compiled photos of Noel – most of them with his fellow officers of the Philippine National Police Special Armed Forces – set to the song “Heaven Was Needing A Hero” by Jo Dee Messina. Watch the video tribute here. “Manong Noel you will be surely missed, especially your smiling face; you will be forever in our lives. You are a HERO; Snappy SALUTE to you dear cousin. Till we meet again,” Abad captioned the video. The Philippine flag is flying half-mast at Sta. Catalina National High School where PO3 Junrel Kibete graduated. Junrel, or Jun to friends and family, spent his younger years in Negros Oriental province. He grew up to be an elite commando but he never lost his fun-loving side. That’s what friends remember the most about him—his teasing, joking ways. PO3 Jedz-in Asjali and his family lost their home in the Zamboanga City siege last year; they had to evacuate. But that didn’t stop Jedz from serving the country. Originally from Western Mindanao University, the 38-year-old joined the Philippine National Police (PNP) in 2002. Jedz was the breadwinner of the family. He had four siblings, including a younger brother Ibrahim who wanted to join him in the PNP Special Action Force. His mother told Bombo Radyo that the last time he left their home, he gave her a kiss and told her not to be sad, that he would be back because he still needed to get married. Friends and family members, still in disbelief over the news of his death, continue to flood his Facebook with wishes for him to “rest in peace.” They want answers, they want justice. On that same page is a photo of Jedz from his training in Virginia in 2013. His arms were outstretched and there was a huge smile on his face as snow fell around him. He looked carefree. Robert Allaga, 35, joined the Philippine National Police in 2005. He was from Banaue, Ifugao province. An uncle said Robert spent his childhood in the mining town of Itogon while his father worked at the Antamok mines. Robert graduated from a criminology course at University of Baguio. His remains were laid to rest beside the Allaga family’s ancestral house in Sitio Patok, Barangay Poitan. Pallbearers had to use an “allasiw” or “batawil” (bamboo cradle) to carry his flag-draped coffin to the remote area. Thirty-three-year-old PO3 John Lloyd Sumbilla had always wanted to die in battle. John Lloyd grew up in Eastern Samar, where his father was once the police chief of Sulat town. He valued his work as a policeman even though he felt like people didn’t always appreciate it. John Lloyd liked watching movies — that was one of the ways he took a break from his dangerous job. The last one he watched was American Sniper. He wanted to watch it again. She refused to accept her husband’s medal of valor from President Benigno Aquino III at the necrological services on Jan. 30. John Lloyd’s mother, Telly, remembered her son as generous, as he always brought presents for relatives from places he went to for missions. PO2 Amman Misuari Esmula, 34, became active in the Philippine National Police Special Action Force in 2006. He was from Zamboanga City and a graduate of Western Mindanao State University. He leaves behind his wife Elisa and their five children. PO2 Peterson Carap, 36 and from Benguet province, joined the Philippine National Police in 2007. Peterson’s wife Janet and Solomon Agayso, Peterson’s classmate and teammate who survived the bloody encounter, told GMA about Peterson’s last moments of heroism. She’s asking for justice for her husband and the rest of the #SAF44. Watch the video here. When Interior Secretary Mar Roxas visited Peterson’s wake at Barangay Irisan in Baguio City, he handed two checks to the widowed Janet. She accepted them but made sure to tell the secretary what was exactly on her mind. Peterson also leaves behind a young son. People say he looks just like his father. Peterson was honored along with six other policemen hailing from the Cordillera region during a Mass at the headquarters of the Cordillera police. His remains arrived early morning on Jan. 31. PO2 Roger Cordero may have died in Mamasapano, Maguindanao province, but he leaves behind in Isulan, Sultan Kudarat province, a son who wants to follow in his father’s footsteps. Archidaniel, his mother Ellen told the Inquirer, is the spitting image of his father, who he continues to look up to. Already, at 9 years old, he wants to be a policeman. “His father was able to really influence him,” Ellen said, even if the idea worried her; she and her husband always talked about the dangers of being part of the Philippine National Police. Roger himself had always wanted to be a policeman. Like father, like son. Two of Roger’s siblings are also soldiers. Roger’s father Herminio said that while it pained him to see his son lying in a body bag instead of standing, alive and safe, he was proud that Roger died fighting. 21. Police Officer 2 Nicky D.C. Nacino Jr. Some people called him Nicky, others called him Dondon. The video, which has been shared close to 7,000 times, is set to the song “Kawal ang Tatay Ko” and shows Nicky in his PNP and SAF uniforms, on a boat, by a plane, in the jungle, at work. There are photos from his personal life too: Nicky at Jollibee, pre-nup pictures, a date with his wife, scenes from his wedding, his child’s baptism. In the last photo, Nicky isn’t holding a gun. He’s holding his bride’s wedding bouquet. Nicky was a new father. His wife’s Facebook profile picture shows them kissing their newborn. Even his fraternity, Tau Gamma Phi, is mourning. PO2 Glenn Bedua, who had been active with the Philippine National Police since 2006, was originally from Dulag, Leyte province. His assignment in Zamboanga City led him to meet his wife Adelisa. They met on Christmas in 2010. Two years later, they were married. Their son Glenden is not even a year old. Inquirer photographer Grig Montegrande took a photo of Glenn’s son reaching out to touch his coffin. She described him as a loving father. Other family members agree that Glenn was a good guy. His aunt Myrna told Inquirer about how he came to the aid of relatives who were affected by Typhoon Yolanda, checking on them and bringing relief goods. “Who would have thought this would be your last birthday cake?” a friend wrote. Chum, who hails from Iligan City, was only 31 when he lost his life. Chum had been trying help keep peace in the country since 2009 when he joined the Philippine National Police. He received a Medal of Valor for his participation in the arrest of Abu Sayyaf member Yatim Batah (Yatin Hakimin). Tributes continue to pour in from friends and family members. There’s a video memorial dedicated to Chum—pictures of Chum’s smiling face, Chum and his family, Chum with friends, Chum sightseeing around the Philippines, Chum in his uniform. His name says it all. Chum—a buddy, a friend. Chum was a member of the Alpha Phi Omega fraternity, which lost six other members in the bloody encounter. More than sixty of their members demanded for justice for the fallen commandos by staging a solidarity walk and lighting candles in Lucena City. PO2 Richelle Baluga of Piat, Cagayan Valley, joined the Philippine National Police in 2008. The 32-year-old and his best friend PO1 Oliebeth Viernes, also from Piat, both died in the Mamasapano operation. Richelle’s remains were brought home to Cagayan on Jan. 31. He was given full military honors for his heroism. PO2 Noel Balaca, 27 and a native of Oras, Eastern Samar province, would also be remembered for his beautiful voice. This his classmate from Philippine College of Criminology – after which he passed the Criminology Licensure Examination in 2010 – made sure to mention in a Facebook post she shared to groups dedicated to the 44 slain soldiers. Noel was also good friends with PO2 Rodel Ramacula. Their multiple photos during and beyond training camps filled the Facebook feeds of their fellow classmates. They were also classmates with Police Officers 1 Windel Candano, Angel Kodiamat and Mark Lory Clemencio. Together, they belonged to “Mabikas” Class of 2010. Noel’s family also had only praise for the policeman. He last spent time with them Christmas last year. “To me, he was a very nice guy … always had a smile, and he loved his family,” recounted an uncle on Facebook. “Siya kasi talaga ang inaasahan ng family niya (He’s really the one his family relies on),” his aunt also posted. Noel was also a huge fan of Christian evangelist Nick Vujicic, if his Facebook account is any indication. The 30-something policeman had liked three fan pages dedicated to Vujicic, a motivational speaker born without arms and legs. PO2 Joel Dulnuan did not let obstacles get in his way. In his desire to finish his degree in BS Criminology at University of the Cordilleras, he worked hard, first as a janitor and then a crew member at a fast food joint, according to the Philippine News Agency. As a child, Joel and his cousins used to play with wooden rifles during their free time in between tending to their vegetable farm. Joel joined the Philippine National Police in 2007 and was a veteran of the Zamboanga City siege and was given a Medal of Heroism for his courage and gallantry in action. The 30-year-old, who died in the Mamapasano operation, was given a hero’s welcome in his hometown on January 31. Residents lined the highway as the convoy carrying his body made its way to Villaverde, Nueva Vizcaya province. Joel was laid to rest beside the grave of his brother PO1 Jackson Dulnuan near their family home in Barangay Ocapon. He leaves behind a wife and child. His sister Corazon is even more determined to pursue her dream of joining the PNP in honor of her brother. Joel has also inspired many from his village to become either a police officer or soldier, even out of school youth and the unemployed. Family, friends and neighbors expressed messages of love and mourning at Joel’s burial and online. “Saludo kami sa’yo, bayani ng bayan,” one sign read. PO2 Godofredo Cabanlet – a native of Lanao del Norte province – joined the Philippine National Police in 2008 after graduating with a degree in BS Criminology from Misamis University. He was proud to be part of the SAF. He loved his job so much that he used his Tagaligtas patch as his Facebook profile picture. But then he discovered a new role that he loved even more: father. Godofredo changed his profile picture to a photo of his beautiful baby daughter. She was born months after he got married in November 2013 and when he was away on deployment, he kept track of his daughter’s growth on Facebook, looking at her pictures and commenting on how cute and jolly she is. Godofredo was only 33 when he was killed in the Mamasapano operation. The country lost a good man. A young girl lost a father. “Second New Year’s Eve together,” she wrote on Facebook last December. She had no idea it would be their last. Many hearts were broken on Jan. 25, the day of the bloody Mamapasano operation. One of them was Kathy’s, the girlfriend of PO2 Franklin Danao. She had been waiting for him to return so they could celebrate his birthday and their anniversary as he had promised. Instead, she received bad news. Franklin, originally from Tinoc, Ifugao province, joined the Philippine National Police Special Action Force in 2008. He was a veteran of the Zamboanga City siege and a recipient of a Medal of Heroism for his courage and gallantry in action. There are photos of Kathy at Camp Bagong Diwa in Taguig City, touching Franklin’s coffin, the glass separating her hand and the uniform he wore proudly. “Thank you for the love, care and support my love, I’ll cherish every moment spent with you…,” she wrote. Kathy isn’t the only one grieving the loss of Franklin. There has been an outpouring of love for him from family members, friends, old schoolmates, even strangers. “Forever in my heart,” Kathy wrote. Online, PO2 Walner Danao and his wife make no secret their love and adoration for their daughter Juliana Elize. The names on both their Facebook accounts have been changed to include her name, their walls littered with Juliana Elize’s chubby cheeks and smiling face. Walner, who originally hailed from Belance, Nueva Vizcaya province, graduated from University of the Cordilleras in Baguio City. Walner was honored along with six other policemen hailing from the Cordillera region during a Mass at the headquarters of the Cordillera police. His remains arrived early morning on Jan. 31. PO2 Jerry Kayob was honored along with six other policemen hailing from the Cordillera region during a Mass at the headquarters of the Cordillera police. His remains arrived early morning on Jan. 31. Family, friends and other mourners paid their last respects to Jerry via prayers, song and dance, and personal stories in La Trinidad, Benguet province. GMA’s Unang Hirit reported that his face was covered with his uniform inside the casket to hide the wounds inflicted on his head. Jerry was laid to rest at the local cemetery in his hometown, Barangay Tawang. He passed the Criminologist Licensure Examination in 2008. PO2 Noble Kiangan was the lone bomb expert among the 44 members of the Philippine National Police Special Action Force that went to Mamasapano, Maguindanao province. He passed the Criminology Board Examination after graduating from Mountain Province State Polytechnic College in 2007. His cousin was the deputy commander of the 5th Special Action Battalion, to which 35 of the slain soldiers belonged. Beyond the badge, Noble leaves behind a wife and young son, who were photographed in front of his flag-draped coffin during the necrological services for the 44 slain soldiers at Camp Bagong Diwa, Taguig. The widowed Kristine was seen kissing her son’s cheek. Noble was honored along with six other policemen hailing from the Cordillera region during a Mass at the headquarters of the Cordillera police. His remains arrived early morning on Jan. 31. When PO2 Ephraim Mejia returned home safe after defending Zamboanga City during the siege in 2013, his family thought the worst was over. But on the morning of Jan. 25, Ephraim’s wife Miya dreamt of gunshots, her husband struggling to carry two big bags. That same day, Buk – Ephraim’s nickname – was killed along with 43 others in Mamasapano, Maguindanao province, during a mission to hunt down one of the world’s most dangerous terrorists. The last time he saw his family was in December last year during a weeklong vacation. His sister Lovely posted on Buk’s Facebook wall on Jan. 26, seemingly unaware of what had transpired. “Here we go again. After the Zamboanga incident, it’s Maguindanao now. Father, may you always watch over Kuya Ephraim and our whole family. Be safe, Kuya. I love you!” she posted in Filipino. Buk, a native of San Nicholas, Pangasinan province, joined the Philippine National Police Special Action Force in 2008. Buk leaves behind Miya and their 2-year-old daughter. He had always wanted to build a house for the three of them in Barangay Calaocan. Several members of the Mejia clan changed their Facebook cover photos to a collage of Ephraim’s photo and the Philippine flag. PO2 Omar Nacionales, 27, never bragged about his status as a member of the elite Special Action Force of the Philippine National Police. His neighbor in Luna, La Union province, told INQUIRER.net, “He was quiet, unassuming and never bragged about his police work.” They found out the details of his work only after his death while on duty in Mamasapano, Maguindanao province. Omar leaves behind a wife, PO2 Gae Ann Guiniling – who is also a member of the SAF – and a brother determined to finish his police education. “Despite what happened to my brother, I will continue my police education and become an officer like him,” younger brother Ezar said. Omar was awarded on Sept. 13, 2014, a Medal of Heroism, which is earned from an act of heroism not involving conflict with an armed enemy. He was also one of the soldiers who defended Zamboanga City during the 2013 siege. PO2 Rodel Ramacula – a native of Rosario, Northern Samar province – was good friends with PO2 Noel Balaca, his classmate at police academy, from which they graduated in 2010. Their multiple photos during and beyond training camps filled the Facebook feeds of their fellow classmates. Among his accomplishments as a member of the Philippine National Police Special Action Force was a Medal of Merit – dated Oct. 1, 2013 – for “his meritorious and invaluable services rendered as member of the SAF.” He was also one of the soldiers who defended Zamboanga City during the siege on Sept. 9, 2013. Another classmate of Rodel’s on Facebook shared how she, too, was close to the slain soldier, even making plans to see each other during the latter’s vacation. “Saan man kayo naroon classmates, babaunin n’yo ang masayang alaala natin sa training. All the trials we encountered. Never say die, sabi mo mate Ramacula. Salamat sa inyong tapat na paglilingkod at paghandog ng inyong buhay para sa bayan. Lagi ko kayong pinagdarasal. Kapiling na kayo ng ating Panginoon,” she wrote. Rodel and Noel were also classmates with Police Officers 1 Windel Candano, Angel Kodiamat and Mark Lory Clemencio. Together, they belonged to “Mabikas” Class of 2010. PO2 Romeo Senin II died a hero. This his sister Rose Keidy Senin says again and again on her Facebook account. #MyHero, she says. A hero indeed, she repeats. Rose will miss, among many other memories of her older brother, their yearly “kakulitan” when she’d go home every December, her Kuya Romeo’s arm draped on her shoulders when together, the laughter whenever she was mistaken for his wife or girlfriend. “I wanna tell the whole world how proud i am to be your sister.. you are our HERO!” Rose reposts. Edelyn keeps as her profile picture a photo of her and her husband, all smiles. On Jan. 22, Edelyn had used as her cover photo a quote, “I’m happy with MY LIFE and I would not let anyone RUIN it.” She changed it two days later. Romeo and Edelyn were married three months ago last year in Iligan City. They had planned to have a child once he got back from his deployment in Zamboanga City. PO1 Russel Bilog joined the Philippine National Police in 2011 after completing his degree in BS Criminology from University of the Cordilleras. The remains of the 28-year-old, who hails from the Mountain Province, were welcomed by the the people who loved him. Sagada elders performed rituals to pay tribute to the fallen hero. For PO1 Angel Kodiamat –a native of Bontoc, Mountain Province – a life of police service runs in the family. Angel was one of 10 members of his clan who work as police officers, according to cousin Supt. Jerome Afuyog. He graduated from Mountain Province State Polytechnic College in 2009. Angel was honored along with six other policemen hailing from the Cordillera region during a Mass at the headquarters of the Cordillera police. His remains arrived early morning on Jan. 31. PO1 Windel Candano – a native of Dumanjug, Cebu province – will be remembered as a man who left no soldier behind on the battlefield. Days after the deadly clash at Mamasapano, Maguindanao province, surviving members of the Philippine National Police Special Action Force (PNP-SAF) spoke highly of the trained medic. They shared with Windel’s wife Michelle how Windel, instead of choosing to escape the battle that fateful day, stayed behind and dragged the wounded to safer ground and treated them. Windel, the soldiers recounted, was killed when he was shot while treating a soldier. Windel’s son Gabriel turned 9 years old on Jan. 24, which made the sudden death harder to accept for Michelle, who works at the Cebu City Post Office. He had called her that day to inform her of the dangerous mission. Windel had also called his mother Marciana and sister Louelyn five days earlier to request that they help send Gabriel to school. Windel was a graduate of electrical engineering but took an exam to become a policeman despite Marciana’s reluctance. He later became part of the PNP-SAF and was assigned to the medical team. At the necrological services for the slain 44 policemen at Camp Bagong Diwa in Taguig, the mother of PO1 Loreto Capinding II let out one hysterical wail after another at the sight of her son’s coffin. Anastacia remembered her son Loreto – a native of San Mateo, Isabela province – as a good man whose fate should have instead been inflicted onto his killer. Loreto was set to marry his girlfriend of seven years, Genevieve Binoya, in 2016. He did not tell her about the Mamasapano mission. Had it succeeded, Loreto would have been reassigned to Isabela to be closer to Genevieve and the rest of his family. Loreto’s remains were returned to Barangay Villa Fuerte around 8 a.m. on Jan. 31. PO1 Gringo Cayang-o was from Sadanga, Mountain Province. In 2010, he graduated from Mountain Province State Polytechnic College and passed the Criminologist Licensure Examination. Gringo was honored along with six other policemen hailing from the Cordillera region during a Mass at the headquarters of the Cordillera police. His remains arrived early morning on Jan. 31. PO1 Romeo Cempron, based in Zamboanga City as part of the Philippine National Police Special Action Force, wanted to seek reassignment to Cebu province after five years of service in order to be closer to Christine, his wife of three years. Christine, a pediatrician, was supposed to fly to Zamboanga on Feb. 17 for a post-Valentine date. They last saw each other during the Christmas season last year, when Romeo extended his furlough after being stranded in the Visayas due to Typhoon “Seniang.” She learned of her husband’s death via a text message from an unknown sender. Romeo, a native of Bohol province, leaves not only a wife behind, but also plans for a baby Cempron. Christine last talked to Meo – as he was often called – that fateful Sunday, hours before they were caught in an alleged misencounter. “He asked me to pray for them because they were off to a large-scale operation. I never sensed that that would be the last time I’d talk to him,” she told Cebu Daily News. 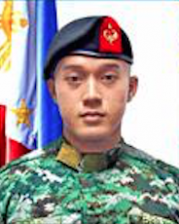 On Facebook, the wife of Romeo’s schoolmate from University of Cebu shared how the slain soldier often rode a bike to school, which was 18 kilometers away from his family’s farm in Barangay Tayud in Consolacion, Cebu province. In the evenings, the post by Michelle Trangia read, Romeo would work as a security guard on the farm in order to support his education, as his father passed away at an early age. “He was true blue hero since childhood. It must have been his fate to die a HERO,” Michelle posted. Before PO1 Mark Clemencio joined the Philippine National Police Special Action Force (PNP-SAF), he worked as an instructor in Tacloban City. He and his family survived Supertyphoon “Yolanda” (international name: Haiyan) when it ravaged Eastern Visayas in November 2013. Mark also worked at Adamson University as a teacher before his death. Originally from Cariaga, Leyte province, Mark was based in Zamboanga City as part of the PNP-SAF. He graduated from Philippine College of Criminology as part of “Mabikas” Class of 2010, to which four others slain belonged: Police Officers 2 Noel Balaca and Rodel Ramacula, and Police Officers 1 Windel Candano and Angel Kodiamat. The Leyteño’s friends and relatives continue to flood his Facebook account – where he used the name Karlo – with messages of disbelief and prayer. One friend called him “a bright and young star laid to rest”; another friend lamented how their plans to hang out in Manila and visit each other would no longer happen. On Jan. 25, 2015, PO1 Joseph Sagonoy, 26, was seen online on Facebook. His older brother James, an overseas Filipino worker in United Arab Emirates, messaged him immediately when he saw the green dot beside Joseph’s name. “Tol, kamusta ka na? Hope you’re OK dyan (Brother, how are you? Hope you’re OK there),” James said. He knew that Joseph was in Mindanao for a mission right after just finishing training. They last spoke via phone call three day earlier before Joseph left for Mamasapano, Maguindanao. Joseph did not reply. Only after James messaged did he get sent via Facebook message an initial list of 41 men – the number has since been raised to 44 – who died in Mamasapano, Maguindanao, on Jan. 25 after 11 hours of fighting. Joseph’s name was No. 28. James struggled to hold back tears in an interview with INQUIRER.net during the arrival of 42 bodies on Jan. 29 at Villamor Air Base. “Dong, I really really want to be a commando. I want to be challenged. I want to be in the field,” Joseph had told his brother. And James, wanting the best for his “very hardworking and diligent” brother, stopped schooling so Joseph could pursue his dream. Joseph passed the Criminologist Licensure Examination in 2010, after which he joined the Philippine National Police Special Action Force. He was also supported by an uncle, Rogelio, who treated him as a son and helped send him to school. If James could talk to his brother now, he would tell him how proud he was. “Kung nakikinig ka sa akin ngayon, mahal na mahal kita. Nabuhay ka na isang lider, namatay ka na isang hero (If you’re listening to me now, I love you very much. You lived as a leader, you died as a hero),” he said. PO1 Oliebeth Ligutan Viernes, from Tuguegarao City, had dreams of seeing his wife Virgie sign up for the police force. “He was always envious of couples who are both serving in the Philippine National Police, so he also dreamed that one day, I can join him there,” she said. It’s a dream that she intends to turn into a reality after his tragic death at the age of 34. “I would want to assume the position left behind by my husband,” Virgie told the Inquirer. After graduating from Cagayan College with a degree in BS Criminology, Oliebeth joined the PNP in 2007. “My husband is a HERO,” she declared in bold letters.